Edrington is set to release its oldest Macallan expression to date – a 72-year-old single malt bottled in a Lalique crystal decanter, priced at US$60,000. 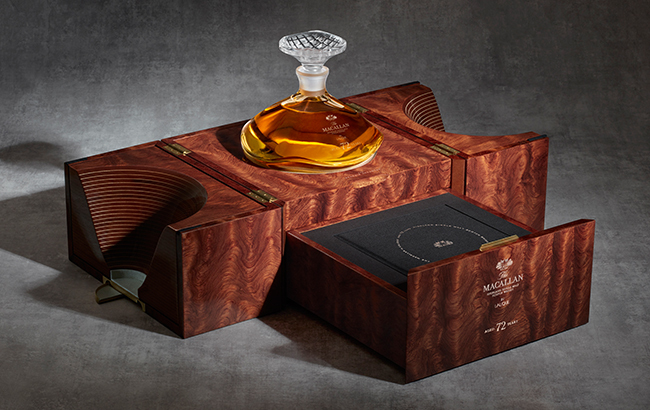 The Macallan 72 Years Old in Lalique – The Genesis Decanter has been released to celebrate the opening of the new £140m Macallan distillery and visitor centre on 2 June. Distilled during the 1940s, the new expression has an “exquisite balance of strong, sweet oak with the peaty spirit shaping its refined character”. The nose is said to have aromas of fruit followed by hints of peat, with a “lingering hint of rich fruit and oak” on the finish. The bottle design has been inspired by the curvature of the distillery’s roof structure, which is said to be suggestive of the building rising and falling from the ground. The presentation case is inspired by the interior of the distillery, with a curved wooden roof over the decanter and a footprint taken directly from the circular layout of the three new still houses. Nick Savage, The Macallan master distiller, said: “The Macallan 72 Years Old is an incredibly rare single malt defined by years of dedication and craftsmanship. The Macallan 72 Years Old in Lalique – The Genesis Decanter will be rolled out globally from August 2018. Limited to 600 decanters worldwide, it is priced at US$60,000 per 700ml . Ken Grier, creative director for The Macallan, said: “Our wonderful new distillery is both a tribute to the traditions of our whisky and its natural Speyside environment, and a future-facing vision, looking forward to the next chapter of The Macallan. Lalique have a deep and true understanding of The Macallan, having been our partner for over a decade.